Traveller? Tourist? Or a bit of both? I always feel something of a fraud when describing myself as a travel blogger. After all, my experience of visiting Asia was a luxury honeymoon in the Maldives, I have never stayed in a hostel (indeed I baulk at the idea of sharing a bathroom, never mind my sleeping space), and generally never travel without at least 20kg of unnecessary clothing stuffed into a wheeled suitcase. I’ve never travelled solo, unless you count a flight to Tenerife to stay with a cousin who subsequently returned to the UK before I did. I’ve never even picked up a rucksack, much less trekked across the globe with one. I regularly get messages from people who want to discuss my “travelling” lifestyle, and I have to confess that I spend much more of my time thinking about travelling than actually travelling. So am I a fraud? I read tales of those with a nomadic lifestyle with envy, and wonder how people can hold down a full-time job, fly to the other side of the world on a Friday and still be back in time for the office on Monday morning. Despite the fun of planning a road trip, or negotiating how to get from A to B, I still like to fall back occasionally on an all-inclusive package holiday, when I don’t have to make any difficult decisions other than what cocktail to drink or which bikini to wear. Even when we organise our own travels – which we have done in Europe and in the States – we stay safe, focus on the must-see sights and largely remain in touristy areas. If we do go off the beaten path, it’s usually because I’ve done a little research beforehand and I know where is “tourist-friendly”. Sleep in a comfortable bed? Make plans and stick to them? Pack everything you might need, including electronic gadgets and plenty of clothing in a big suitcase? Visit cities, museums and tourist spots? Then you are a tourist. Ah, sometimes I’m a tourist then. Take photos using pro equipment and a tripod? Sleep in a hammock under the stars? Take whichever path interests you? Pack one change of clothing, a phone and a camera in a rucksack? Participate in extreme sports and activities? Then you are a traveller. Ah, sometimes I’m a traveller then. See how hard it is define? I like to sleep in a comfy hotel with running water and electricity, but that’s a relief after spending the day outdoors. I like to make plans and do research, but not to the point where I’m inflexible. And yes, I like to take selfies (not with a selfie stick though…) but that’s cos Mr Fletche takes all the beautiful professional-level shots, and someone needs to capture us being silly in front of the Atomium or the Golden Gate Bridge with a point-and-click. I wish I could travel more. I wish I could abandon family and financial responsibilities, sell my house and car and see the world without stopping. But until then, I will remain a sometimes traveller, sometimes tourist, but full time travel dreamer. 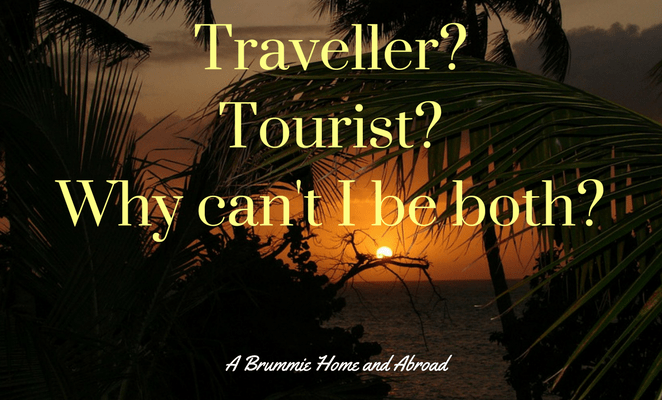 Are you a tourist or a traveller? Or are you, like me, a bit of both? "USA Sept 2013: Baseball, education and a place where everyone knows your name…"
"Feb 2014: A hankering for Hungary"
I really don’t like the label of either one. Whatever you are doing, you got out of your routine and saw something new. It’s like reading. If you are reading a magazine, you are still reading. You don’t have to be reading the classics! Absolutely, and I love that analogy! Surely travelling just means moving from one place to another? And being a tourist means not being ashamed to have fun while you’re doing it! I like to think a traveller is one who connects with the locals and the culture more and stays longer in one place a slow traveller and a tourist is more a sees the better parts, a fast mover and also concentrates on seeing the highlights of a country?